What is in a name? What is in a bottle? And what is in the packaging? There is much we can learn from whiskey bottles and from whiskey that can teach us much about our human friends. One of my sons-in-law was never into drinking alcohol – which is fine with me. But one Friday night as we finished the fish course I brought out my bottle of Jim Beam to make a 'l'chaim'. I gave him a super sweet locally made Israeli chocolate liqueur to drink instead. He likes the sweet life and what is wrong with that? He asked me about my choice of drink; why do I drink this stuff instead of his choice, the sweet stuff. I told him that I enjoy bourbon; the taste is very pleasant and pleasing to me and so it is my custom that after the fish course on Friday night, I always have a small shot glass of bourbon. Jim Beam is my favorite. I offered it to him. He tried it but did not like it. Jim Beam is not sweet to sugar lovers. Being an inquiring person and seeing my Friday night custom for many a Shabbat evening, he asked what is it that makes the this bourbon better than others types of drinks. Now just realize that Jim Beam is not very expensive. I do have more expensive drinks on my shelf, I have Booker's and Glenlivet, to name a few, but Jim Beam is just fine to me. I explained that it is the taste that counts to me. True, there are more mellow drinks and much more expensive drinks, but Jim Beam is fine to me. I do also like a spiced bourbon. Now people drink for one of two reasons: the taste or the effect. Most people are not really into enjoying the taste of what they drink so the manufactures try to make their bottles look appealing. What looks the most interesting, I asked him. 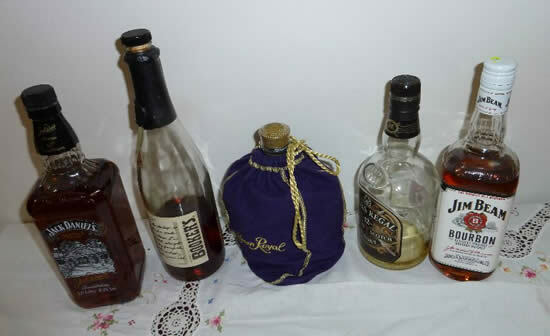 He pointed to the bottle of Crown Royal; it comes in a small fancy royal blue pouch. I agreed that this did the job of drawing one's attention to it, but in my humble estimation, the other drinks are, if not better, they are at least just as good. Today, the emphasis is on the bottle. As an example, I pointed out the bottle of Booker's. I like Booker's. But Booker's is not like the normal whiskey or bourbon. It is (supposedly) 100% in the bottle as it came out of the barrel – not mixed with water; where as the normal whiskey is bottled alread pre-mixed with water, Booker's is not. The originator of the Booker's brand, Booker T. Noe, said that he wanted to duplicate the whiskey that he had encountered when he was young before the commercialization of whiskeys. He said that people would go down to the distillery with a bucket and fill it up and take it back home and each person would mix it themselves as they saw fit. Sounds good; so they put a label on the bottle that lends one to believe that it was a hand made label, hence the drink inside is something hand made, which it is not. Look at the label on the Chevas Regal bottle. It is like a royal crest giving off a aura of upper class elitists. Jack Daniels' label is designed to give you the feeling of drinking that you are drinking the same old stuff that was made a hundred years ago – a connection with whisky tradition. It is the packaging that sells today; what is in the package is not really as important as what the external packaging conveys. People are similar. How many people dress for effect? I think most. They want their external manifestation which is the seen first to impress, to convey an image, as if the internal person is like the external packaging. Ever read tips on how to land a job? The first thing they stress is dress for the job. It is only later that the internal person, the real thing comes out. Often internal person does not meet the standards of the external image. I have another son-in-law. He is a bit of a snob, or I should say, was a bit of a snob. In Israel, about fifteen years ago, Coca Cola was the most expensive cola drink available. There was also Pepsi and RC on the market, but this son-in-law preferred Coke simply proclaiming that it was much superior to the others. It so happened that on one Shabbat when he was staying by us, we had Coke, Pepsi and RC on hand. I suggested that he take a taste test to see if he could identify which of the three drinks was Coke. He accepted the challenge. I took one of my sons into the kitchen and pulled out three plastic cups and set them next to the three bottles of cola. We filled each with one brand of cola and brought it to my son-in-law to taste. Only myself and my son knew which was which. My son-in-law could not figure out which was the 'real thing' from the other one. He was totally baffled! My sons seeing that my smug son-in-law could not figure out which was the real coke asked also to take the 'taste test'. Out of four sons, only one guessed the correct drink. Of course, statistically speaking, out of five tasters tasting three drinks, one is bound to guess correctly. The moral: we are more influenced by the externals (in this case the heavy advertising campaigns for Coke) than the actual thing itself (the taste). From that time on, my son-in-law got only RC, the cheapest cola drink in Israel and he drank it – and with out any complaint. Let us be careful to with hold judgment based on first impressions. What we see is not always what is really there. Actions that may look bad can actually have good motives and actions that look good can have evil intentions.